Concrete designs are trending in contemporary home design, being used in stamped concrete driveways, concrete pool decks, concrete countertops and outdoor kitchens. Today’s homeowners, builders, and designers recognize the versatility, long life, and overall value of concrete in their designs and plans. From expansive new homes with elaborate concrete driveways to budgeted one-room remodels showcasing a stunning, acid stained concrete floor, the attraction is continuing to grow when it comes to using concrete for decorating. 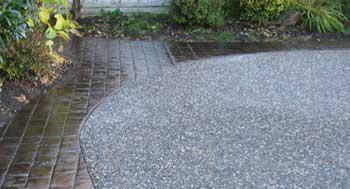 Concrete is no longer plain, grey and boring. 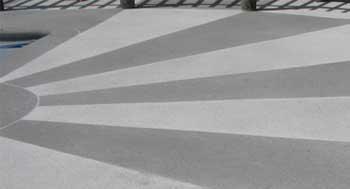 Advancements in concrete tools, concrete stains and dyes, textures, and patterns have made concrete the most versatile, durable and cost-effective material on the market. Decorative concrete aka decorative cement lets you decide which hue of red will give you that Spanish tile look on your pool deck at a fraction of the cost. This process also increases your design options, such as which personal mementos you’d like to embed in your new concrete countertop kitchen island. Choosing decorative concrete in your design plans will transform traditional grey concrete into warm brown floors, expensive slate-looking patios, and weather-resistant outdoor kitchens and concrete countertops, to name a few. 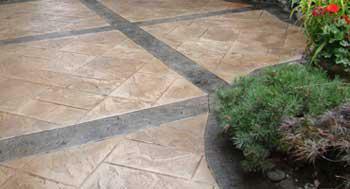 You will also see concrete design used on concrete patios, concrete floors, entryways, pool decks and more.